Thrash Metal riffs: are consider them to be one of the most magical parts of Heavy Metal music. The sharpness, the paranoia and the headcrushin’ charisma of chords and licks played in order to raise your adrenaline to levels of no return is possibly the case for a whole bunch of bands making it big or bigger in the 80s and early 90s. With younger bands now spewing out of nowhere to honor the godfathers of Thrash Metal (most of the old bands are now defunct and enough of those ‘big’ ones are now flirting with more modern territories or have distanced themselves from their birth ideologies, to say the least). REZET is a four member outfit from Germany and “Have Gun, Will Travel” is their first official full release, after a pair of demos and a self-financed EP. Their love for banging Thrash music is undisputed; tons of shrieking guitars with lots of work being done in the solo/dual leads, piercing vocals spitting words like there’s no turning back and pounding drums on the edge of complexity are some of the albums ‘key’ components. 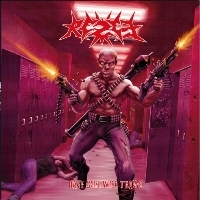 While being Germans, REZET seem to prefer hanging out with the American Thrash Metal perspectives, showing enough of interest in writing speedy yet technical songs and not only rely on the in-your-face attitude of most of their compatriots. Basic influences of the band include the makings of EXODUS, FLOTSAM & JETSAM, MEGADETH and the sophisticated side of SLAYER. Originating from Germany, though, can bring some short of reference to bands like late DEATHROW or ‘serious’ TANKARD and the quartet does not necessarily try to divide these two schools in respective parts. Hence, the songs in this LP have enough variety and there’s a good chance you’ll need to spend enough time to swallow their material (seven normal songs and an instrumental intro – remember MEGADETH’s “Into The Lungs Of Hell”?) but if you show good faith you’ll probably enjoy 36 minutes of beautiful well-produced music. The cover artwork will be different in the LP and CD editions, with the digital version already being available (the vinyl format is scheduled for mid-November 2010). I admit I did not lose my head listening to “Have Gun, Will Travel”; the legacy of Thrash Metal is so heavy and solid rare are the times someone shall succeed in raising new standards. Still, if you’re a regular buyer of this genre’s products it’s not a bad idea to add REZET’s name to your shopping list. These Germans have created a nice album and their work should not go unnoticed.